Despite 14 years of combat, the Taliban in Afghanistan are still strong and are launching another massive offensive. Can the extremist tide be stopped? Will Afghanistan be able to hold - and does the American presence help in the fight against radicalism, or it is just damaging the unity of the already devastated state? We ask the former President of Afghanistan, and still a figure of immense power in Afghan politics: Hamid Karzai is on Sophie&Co today. Sophie Shevardnadze: His Excellency Hamid Karzai, the former President of Afghanistan, welcome to the show, it's great to have you back. 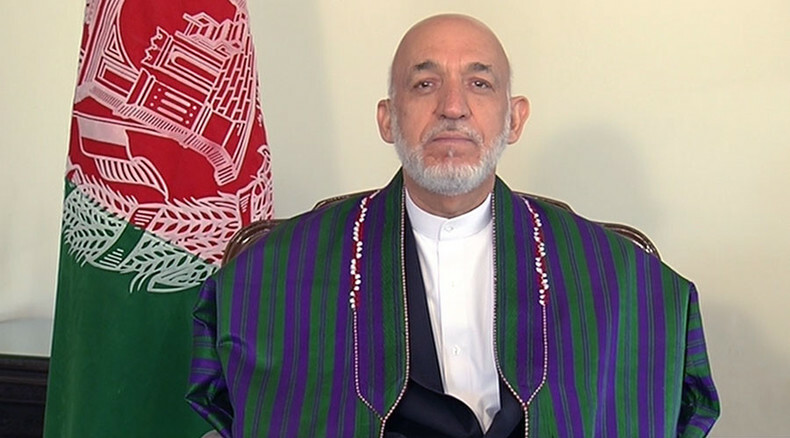 Hamid Karzai: Thank you, happy to be with you. SS:Now, Mr. Karzai, for 14 years the strongest armies in the world were fighting terrorism in your country, yet, you've said there's more radicalism in Afghanistan today than ever before. How do you explain that? HK: Well, unfortunately, yes, there is more radicalism in Afghanistan, and indeed, in the whole region, than there was ever before. That is why I've been calling for a long time now for re-thinking of the strategy in the fight against terrorism; for re-evaluating whether this struggle against terrorism is a failure or if there's a broader issue at hand here that we don't know yet about or we don't understand. Therefore, you're right, it’s very much time, rather long overdue, to reconsider the whole question and to find answers together with major countries in this region, meaning Russia, China and India. In other words: the U.S. and its NATO allies must now begin to consult with major powers and explain it. SS:But how do you explain the phenomena that I have cited in the beginning that for such a long time, the greatest powers, the greatest military powers were trying to fight terrorism in Afghanistan, and yet they have failed. How was that even possible? Is it their failure? HK: We must first find out if this has been a failure, but if this is not described as a failure, by the U.S. and its allies, then we need to have explanations from them on what else is the reason. Therefore, we have questions, too, here in Afghanistan, as people have questions around the world. There's no doubt that radicalism has increased, there's no doubt that extremism has increased, there's no doubt that suffering has increased, especially in Afghanistan and in the Middle East, so we need answers and we need to scratch our heads and explain it. SS:Now, we're seeing the Afghan taliban launching its biggest offensive since they were toppled, briefly taking the city of Kunduz. How dangerous is their operation? HK: That was very unfortunate for people of Kunduz, and then the suffering that followed, for the civilians and the bombing of the Medecins Sans Frontieres Hospital - all of that should bring us back to your first question on how come there's an increasing radicalism and who is responsible for this. We know that such a large force cannot ever get together and launch such a major operation against a major Afghan city without foreign backing. Now, if this foreign backing, as we suspect, came from Pakistan, then, our allies, the U.S., who are now having bases here, who have a bilateral security agreement with Afghanistan, in which there's a clear reference to helping and defending Afghanistan if there's a foreign aggression against Afghanistan, that has to be then looked at and explained - both by the U.S. and by Afghans as well. Therefore, we need to explain to the Afghan people the fact of the matter. SS:We're actually going to get to who is backing Taliban for it to be so strong at this point, but before we get there, I want to ask you something - your Excellency, we see the U.S. is praising the Afghan Security Forces, we see the Defence Ministry making such statements all the time, kind of exaggerating their work - why are the Americans painting a rosy picture in Afghanistan, when the reality is much more serious? Who are they trying to fool? HK: The Afghan forces are, no doubt, heroic, no doubt they fight very well, no doubt they are trying to defend their country, but the Afghan forces are not properly equipped, they don't have the right weaponry and right elements needed, as far as the military training and all of that is concerned to provide a good defence of the country. But, even with a very strong force, if there's continued foreign intervention, and that intervention is left unanswered for years, you're doomed to get into situation like we are in Afghanistan. This has been one of my major issues with the U.S., with other allies: first, the training of the Afghan forces, the proper equipping of the Afghan forces, and then, addressing the question of sanctuaries beyond Afghanistan. As long as that continues, we will continue to suffer, meaning: the sanctuaries abroad, and the helping from abroad - as long as that continues, we will suffer. SS:So, when the Americans launch a bombing campaign to help Afghan forces to fend off Taliban offensive, is this a good thing or a bad thing? Is this efficient way to do things? HK: Not at all! I have been, from the very beginning, against aerial bombardment of my country, and I've said repeatedly and I would repeat myself again, that the War on Terror is not an Afghan villages, it is not in Afghan cities, it is not in Afghanistan; that, if we want to succeed against terrorism, we must go to the sanctuaries, we must go to the training grounds, we must go to those who finance them and support them. Unless we stop that, we are only causing harm to civilians in Afghanistan. Therefore, it is for this reason that I did not sign the bilateral security agreement with America, because this could not be explained to me in a manner that would satisfy me; so, for us, Afghanistan, the regional and international community, it is now time that we look into the whole 14 years of the War on Terror in Afghanistan and beyond, with a critical analysis, with finding truths and with finding those who are behind backing of extremists, wherever they may be - in this region, or beyond. SS:Now, you've mentioned the horrific accident that took place just recently, during the clashes in Northern Afghanistan, where U.S. planes bombed a Doctors Without Borders, MSF, Hospital. Now, the U.S. says the strike on the MSF hospital was a mistake. MSF says the exact coordinates of the facility were well-known and regularly shared with the U.S. and Afghan forces. Why was this information ignored by the U.S. air force? HK: I can't answer that. I don't know why this information was ignored, but I can tell that the reason I banned the use of air force in Afghan villages and towns and cities was because of the very clear fact that we all know: such operations will inevitably cause harm to civilians, because that's where the civilians are. So, whether it was a mistake, or not a mistake; whether it was deliberate or an accident - in any case, using an air force in cities and populated areas is wrong, definitely and without any doubt. That's proven. SS:According to American press, the government in Afghanistan is arming militias and local warlords to help stop the Taliban offensive. Is this going to work, in your opinion? HK: No. I don't know if there's such a plan, I haven't heard of it, there was talk about it, but I have not seen any government decisions in this regard. Creating militias is not a solution to the difficulties in Afghanistan. The solution is in three clear areas. One: that the U.S. and its allies must now begin to… if the War on Terror is genuine, if that's exactly what they want, they must now begin to consult with major powers in this region, that is China, India, Russia. Two: they must focus on sanctuaries, on training grounds, on motivational factors, on schools and madrasas which are providing training and sanctuary to extremists, and on those who provide them with resources, whether these resources are provided in our neighborhood or beyond our neighborhood. Three: the international community, the U.S. and other allies of Afghanistan, must begin to support Afghanistan strongly and effectively in the proper training and equipping of the Afghan forces, and provide this country with proper infrastructure and economic support. SS:But also, I feel like inside Afghanistan people are very much split. I read in New York Times a quote from a police chief from a city that was fighting off the Taliban assault, and he said that "it's easier to let the Taliban rule, because the government is failing". What is the government doing so wrong to make people think like this? HK: Well, there are individual opinions, of course, around us, some in one direction, others in other direction. I'm a former President of Afghanistan and for me, to publicly speak about my government is not right, other than in approving terms, other than making sure that the government functions and delivers well. SS:Peace talks with the Taliban failed this summer, do you believe in continuing these talks in current situation? HK: Absolutely. Peace is imperative, the talks are imperative. Those Taliban, who are Afghans, who belong to this country, are requested to come back to Afghanistan and free themselves from foreign use, from foreign exploitation, and come back to their own country and rebuild this country along with other countrymen. There's no other way. I hope, sense will prevail in them, I hope patriotis will prevail in them and they will participate in rebuilding of this country and bringing peace in this country. SS:But from what I understand, some of them have very different sense of what patriotism may be, that differs from your understanding. Can you really trust a Taliban? I mean, what's to stop some parts of Taliban from signing a peace deal, while others splinter and continue with the terror? HK: I understand very well what you said, ma'am, that their definition of patriotism may be very different, but, the Taliban say that they will not stop fighting unless all the American troops are out and unless the Americans no longer have bases in Afghanistan, but that may be exactly a tool to hurt Afghanistan further. Therefore, if they want the Americans to leave, because the Americans are saying that they will stay in Afghanistan, because there's more fighting. So one statement is reinforcing the other statement; in order for Americans not to have any reason anymore to stay in Afghanistan, the Taliban must end fighting, must participate in peace and then the Afghan nation will decide on terms of relationship with the U.S. and other countries. SS:Not Afghan and Pakistani governments have vowed to fight Taliban together. Do you think that's happening? HK: That is not happening, ma'am. If that was happening, our country and Pakistan itself would be a lot more peaceful. SS:The UN says the Taliban now has the greatest reach in Afghanistan since 2001, when the war started. With offensive in the East and the North, why would they really be serious about talking, if they can just win the war? HK: Well, because war, eventually, is not the solution. War will bring more suffering. They may have an upper hand in some areas of the country today; they may not have that tomorrow. Therefore, again, love for this country, if they consider themselves Afghans, as we consider themselves Afghans, then they must, for the love of this country, stop being used by foreign powers, whoever that foreign power may be. It may be Pakistan, it may be other countries, far and away from Afghanistan, that may use the Taliban for their own objectives. That should not happen, they must begin to work entirely for an Afghan purpose and an Afghan interest, and the primary interest of all those interested in peace in Afghanistan. SS:But let me ask you this, would Taliban really ever agree to something less than completely restoring their own regime? HK: To those Taliban that I have spoken in the past, a complete return of their regime is not what they seek. What they seek is an opportunity to be back in their country and live in peace, but they need guarantees as well - they needed them then and I'm sure they do the same now, from the Afghan government and also from the U.S. and its partners. SS:So, they have to be part of Afghan government, right? HK: They have to be part of the Afghan polity. They are Afghans and they must benefit from all that Afghanistan offers through the Afghan Constitution. They should have responsibilities, they should have privileges as Afghans, and obligations to this country, just like we do, as Afghans. SS:Benefiting from the policies and being part of government is different things. Do you think Taliban should be part of the government? HK: If they return to Afghanistan in peace, they are Afghans, they have all the right to be part of the Afghan government. How come I have the right to be part of the Afghan government and not them? So, citizens all have equal rights, as Afghan citizens, they do have the right to be part of the Afghan government, but once peace returns, surely. SS:Your Excellency, you have said the Americans in Afghanistan have pursued a double policy: what do you mean, exactly? Does this mean that American military was not a 100% dedicated to destroying the Taliban? HK: The double policy, for me, when I said it, meant that the U.S., on the one hand, said that terrorism did not emanate from Afghanistan that these sanctuaries were beyond Afghanistan. Admiral Mullen, then a U.S. MIlitary Chief of Staff, said in a statement some years ago that one of the Afghan groups, the Haqqani network was a proven arm of the ISI. If that was the case, then how come they provided support to the ISI as well and to the Pakistani military as well? So it was this that caused... and other facts that were available to us, that we have heard from Americans time and again, that make us suspicious. You cannot be helping the victim and the perpetrator of an atrocity in the same time. If they are with us, fighting against terrorism, they should not be with those who are supporting terrorism. SS:As of right now, the Afghan army is fighting with American help. The Americans want to leave Afghanistan. Do you want their troops to leave? HK: The Americans, of course, are not going to leave Afghanistan. They have a bilateral security agreement signed with our current government. I would want the U.S. to stay in Afghanistan with a condition that they respect the unity of the Afghan people and not hurt the national unity of Afghanistan, that they make sure that Afghanistan is peaceful and that the peace process begins with the Taliban. SS:Now, the U.S. and other countries are not only helping with troops. Most of Afghanistan's budget is made up of international aid. Tens of billions of dollars have been poured into the country over the past decade and yet poverty is still rampant in Afghanistan. How come? HK: Getting rid of poverty is not going to be done by the assistance that we receive. We will only get rid of poverty if we have peace and when we work hard, ourselves, as Afghanistan's. Then, we will be a more prosperous country. SS:But a lot of international aid to Afghanistan is described as "phantom aid". I'm sure, you know about it. For instance, 60% of Canadian funding has to be spent on Canadian goods. Why isn't the Afghan government in control over how the aid is distributed? HK: You are very right about that. This has been one of the problems that we had all along, with the money that came to Afghanistan, but was not delivered to Afghanistan. All was delivered to projects that were of no use to Afghanistan. All was done in a manner that eventually the money evaporated away from Afghanistan: so, you're absolutely right. It is for this reason that I said earlier that we will be out of poverty as a nation, only with our own hard work. Of course, this doesn't mean that we do not encourage help coming to Afghanistan - we encourage it, we are grateful, but like any other nation, Afghanistan can only be built with our own hands and our own hard work. SS:Your Excellency, you've said that Islamic State poses no danger to Afghanistan. However, recently groups who swore allegiance to IS have made gains in the area not far from Kabul. Isn't that a bit alarming? HK: The Daesh or IS is not at all an Afghan element. It's totally foreign to Afghanistan, it has been brought to Afghanistan by foreign, you know, elements, foreign powers. If there’s ever a rise… and if that is true that Daesh has 30,000 members and fighters and weapons and all the means, then it means that there's a foreign force behind them and that the foreign forces are using Afghanistan for the training and equipping and for the promotion of IS. Not mainly for Afghanistan, but for other purposes. So, I'm very-very confident, ma'am, that this isn't Afghan, this force, that it has not originated in Afghanistan. We know that Taliban are Afghans. That - we are sure about. We know their villages, we know their leaders. But I can tell you for a certain, certain fact that Daesh has not originated in Afghanistan and if it grows in Afghanistan, if it has more people in it, if it has more funds, if it has more weapons, if it has more fighting ability - then it is done by an outside force, for an outside purpose, and which means a danger for this region - that's where Russia, China, India and other countries should be aware and alert and work against it. SS:Cabinet ministers and tribal leaders and elders from across Afghanistan are actually said regular guests at your residence in Kabul. Does the country's elite come to your for advice? And what about the current President of Afghanistan Ashraf Ghani, does he ever contact you for advice? HK: Yes, we are in contact, not as much as we were initially, but we do have contact. I met him just week. The Afghan tribal elders, the Afghan people that visit me, this is in keeping with the traditions of Afghanistan, and as a former President of Afghanistan I do engage with the Afghan people and I do consult with them, and of course, we have concerns for Afghanistan today and tomorrow. It's our country and we will do all we can not to allow Afghanistan to lose the gains of the past 14 years; and, also, to make sure that we have a better future together with other countries in this region, including Russia. SS:But are you thinking about returning to politics in some other capacity, may be, other than the President? HK: No, ma'am. I have done my time, I was the President of the country for 13 years, and I’ve done my Constitutional terms. I will not return to politics, but I will be very much active in making sure that Afghanistan does not fall back into more difficult days and that Afghanistan gets a better tomorrow: for us, for our young ones and for future generations. SS:Thank you so much for this interview. Your Excellency, we wish you and your country all the best. We were talking to Hamid Karzai, the former President of Afghanistan. We were discussing the recent Taliban offensive across the country, and if the Afghan army can handle it without foreign help. That's it for this edition of Sophie&Co, I will see you next time.